Google Classroom Users: Thanksgiving is a time for family and fellowship so teachers often avoid teaching anything too heavy before the holiday. For this reason, we created a product that focuses on punctuation and capitalization of text evidence and dialogue. It provides our students with some much needed practice themed around Thanksgiving while also taking the pressure of retention off of the teacher! 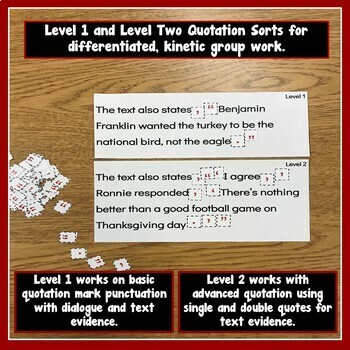 Level 1 Quotes Punctuation Practice: In this interactive and versatile product you can review in whole group, small group, or use this as a pre/post assessment tool to see how much your students really know about punctuating text evidence and dialogue. We know that students often struggle with this skill, but it’s so important when it comes to any formal writing that we ask our students to do! Answer key is provided. Level 2 Quotes Punctuation Practice: This product scaffolds for our students who are ready for a little bit more of a release of control. We take away more of the modeling and insert more complexity into their practice. This would be perfect for challenging your higher students in small group or independent study! Answer key is provided. PDF Version of Quotes Punctuation Practice: Not a one-to-one technology school? We have PDF versions that STILL encourage interaction with highlighting, reference to models, and repetition. Use these as exit slips, quick checks, fast grades for the gradebook, or small group practice! Answer key is provided. Quotes Punctuation Practice Sort: This takes several sentences from the slides and provides a more hands-on approach for our students. They get the opportunity to manipulate the punctuation marks and insert them into the text evidence and dialogue in the appropriate places. What a perfect way to reach those lower students who need to see it several times more or for an initial informal pre-assessment to give the teacher quick information! An answer key is also provided for the teacher to allow the students to do a quick check themselves or with their accountability partners. There are so many ways to utilize this sort for effective practice! 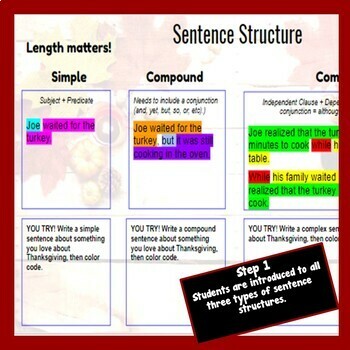 Sentence Structure: This product teaches the students in an interactive lesson about each type of sentence structure that authors use. 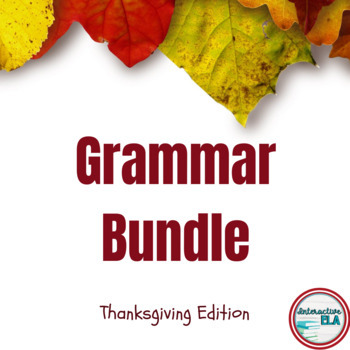 It then encourages them to apply their learning in their own writing with a Thanksgiving twist for high engagement. It is a great lesson to teach sentence fluency and application with some fun, relatable writing prompts. We encourage you to make this lesson accessible to students so that they can apply their learning, develop their stories, and interact with texts while also having all the information to give reference to. Answer key is provided.